Janice is a research scientist in experimental condensed matter physics at Johns Hopkins University. Her research interests include nanoscale physics, scanning probe microscopy, superconductivity, and energy related materials. Currently she is working on graphene in collaboration with Nina Marković's group. Graphene is an atomically thin sheet of carbon atoms which has remarkable properties. 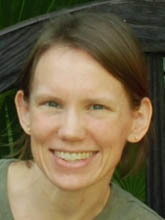 Janice got her Ph.D. from Stanford University where she worked with Kathryn Moler. Prior to coming to Johns Hopkins, she was a postdoc at Cornell and then taught physics for two years at Texas A&M.